Public agencies are being pressured for innovation, driving service delivery towards a more personalized, outcome-driven, participative, efficient, and collaborative model. In this regard, social media has been told to be a potential powerful tool to support public engagement, intended as the improvement of public services and the establishment of relationships between government and citizens based on information sharing and dialogue. 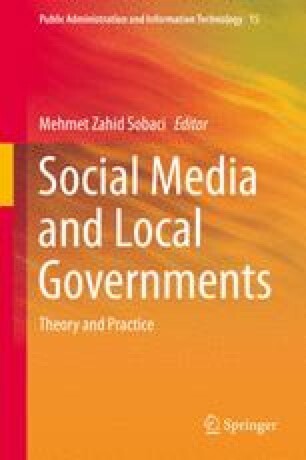 This chapter captures the perception of policymakers responsible of strategies for e-government in local governments with the aim at analyzing the following research questions: (a) Do policymakers think that Web 2.0 technologies promote the effective involvement of citizens in the improvement of public sector services? (b) Do policymakers think that Web 2.0 technologies promote the technological innovation in public services? and (c) Do policymakers think that Web 2.0 technologies promote the sharing knowledge needed to improve public sector services? To answer these research questions, an e-survey was sent to policymakers responsible of strategies for e-government in large Spanish local governments. Findings indicate that policymakers are prone for using Web 2.0 technologies to engage citizens in the process of public services delivery, but only making suggestions through consultations. No co-production or technological innovation is expected from citizens because they are expected to play a passive role more than an active one.